Thanksgiving is just around the corner. Do you know what you're baking yet? How about these Turkey Cupcakes from What's New Cupcake? 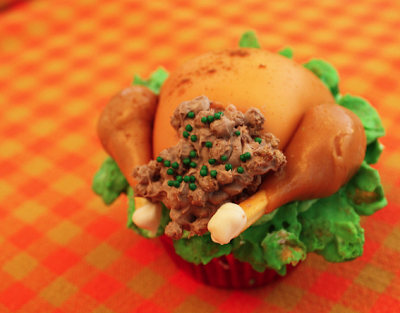 Came across this Turkey Cupcake from Saucy's Sprinkles via Party Cupcake Ideas. Super cute, but I just don't have the time to decorate something as detailed as this. But that's just me, I'm impatient. Don't forgot: Tonight is the celebrity edition of Drive Out Hunger's OC DinDin-A-GoGo. Come join the 20 celebrities, 19 food trucks, and top food bloggers as we help raise money and bring in donations for Second Harvest Food Bank. Admission is free, parking is free, 10 cans or other non-perishable food items will get you into the celebrity autograph area. If you don't live in the area, you can still help out by giving virtual donations here. See you tonight!